Funny, but we don’t hear that this new version of “Annie” has an Oscar Award-winning actor (Jamie Foxx for “Ray”) and the 1982 version didn’t (although Albert Finney was nominated for seven Academy Awards). And the new Annie (Quvenzhané Wallis) received an Oscar nomination for her first movie (“Beasts of the Southern Wild”). Can’t we please get a rest from race issues long enough to enjoy a two-hour movie? 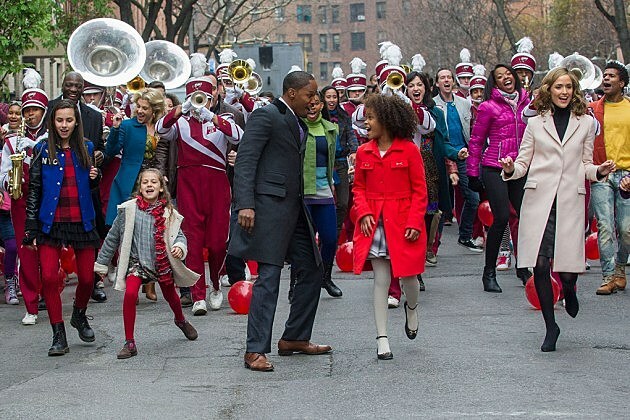 There’s nothing groundbreaking in the new version of “Annie,” but it is an entertaining and enjoyable movie. Quvenzhane is terminally cute as the lead character Annie; a foster kid who, besides her circumstances, is constantly upbeat. (“The sun will come up tomorrow!”). Annie lives in a house filled of her foster sisters. They get the minimum amount of care from their foster mother, Miss Hannigan (played by Cameron Diaz), who constantly reminds them that they are only there so she can collect the money the city pays her each week ($150 per kid). The song and dance scenes are the best part of the movie. A few new songs were written for the new version of the movie and they are sung incredibly by the young Oscar nominee. Foxx, a Grammy nominee, can definitely carry a tune and Diaz plays her role for laughs, especially when she attempts to sing. You’ll want to stay for the first part of the ending credits. The show’s finale is performed over the closing credits and some cute out-takes are also featured in the ending of the movie. Annie is rated PG for some mild language and rude humor. The movie has a run time of just under two hours (118 minutes) and even a small child will sit through most of the story (I took my grandchildren to the screening). On my Hollywood popcorn scale, I rate Annie a jumbo!